WASTED! The Story of Food Waste aims to change the way people buy, cook, recycle, and eat food. 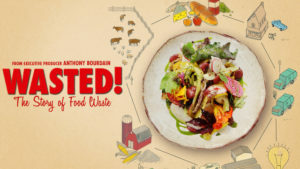 Through the eyes of chef-heroes like Bourdain, Dan Barber, Massimo Bottura, and Danny Bowien, WASTED! exposes the criminality of food waste and shows us how each of us can make small changes – all of them delicious – to make the most of every kind of food. Sharing a communal desire to practice environmentally responsible gastronomics, LA’s top culinary influences have partnered with Chefs Collaborative and L.A. Kitchen to discuss the issue of food waste. After the film, engage with a discussion panel featuring Chefs Neal Fraser of Redbird, Nyesha Arrington of NATIVE, and Michael Cimarusti of Providence. The discussion will be followed by a reception featuring local restaurants devoted to combating waste through their menu choices, including Preux and Proper, Huntington Hospitality by Bon Appétit Management Company, and more.